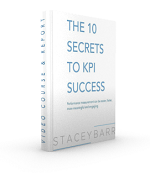 People can feel very threatened by performance measures, when they feel the measures are judging them personally. That’s the topic of this Harvard ManageMentor video with Stacey Barr. How well attuned are you to the ways that measures make people feel? What can you do to help them see measures as tools to help them improve processes rather than taking them personally? Your point about consultation & negotiation is well founded. A good dialogue with some challenge is needed from other managers & peers to enable some form of continuous improvement. Questions still need to be asked. e.g. Is this a valid measure? Mark, you’r right. I am seriously thinking now on the question: What prerequisites does a manager or executive need to have before it’s worth helping them measure performance. Their reason for measuring is one of them, such that I will refuse to work with someone who clearly wants measures in order to control the behaviours or perceptions or beliefs of other people. Stacey Barr, you’re right in your reply to Mark’s comments when you said, “Their reason for measuring is one of them, such that I will refuse to work with someone who clearly wants measures in order to control the behaviours or perceptions or beliefs of other people.” Many a times, leaders are afraid of measure performance or fear that delegates will perform so well that they will challenge the delegator’s own position. That’s one of the key problems for lack of meaningful performance measure. Matthias, another key problem for lack of meaningful performance measures is the belief that measures tell us how PEOPLE are performing. Rather, measures should be telling people how PROCESSES are performing. That takes much of the threat away for everyone. Thanks for sharing. Wow! 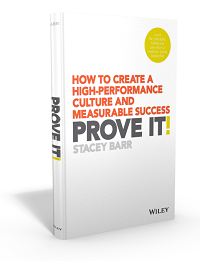 Great insight Stacey – believing that measures tell us how people are performing as opposed to how processes are performing. Thank you! 🙂 Thanks for your kind words, Ben. 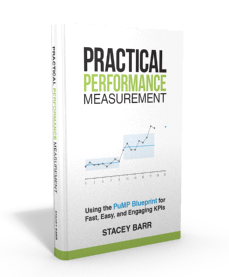 Stacey Barr, I very agree with you when you wrote, “People can feel very threatened by performance measures, when they feel the measures are judging them personally.” I have found out many times that people are afraid of honest feedback when it comes to measure performance. I feel that accepting honest feedback in good faith, careful listening, clear communication, without much ado or self-defense, or fear of delegation, to mention but few. I firmly believe that removing that above mentioned obstacles will greatly enhance innovative ideas, and improve performance measure.